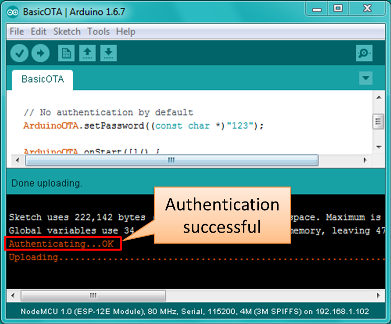 By default there is no imposed security on OTA process. It is up to developer to ensure that updates are allowed only from legitimate / trusted sources. Once the update is complete, the module restarts, and the new code is executed. The developer should ensure that the application running on the module is shut down and restarted in a safe manner. Chapters below provide additional information regarding security and safety of OTA process. No guarantees as to the level of security provided for your application by the following methods is implied. Please refer to the GNU LGPL license associated for this project for full disclaimers. If you do find security weaknesses, please don’t hesitate to contact the maintainers or supply pull requests with fixes. The MD5 verification and password protection schemes are already known as supplying a very weak level of security. The module has to be exposed wirelessly to get it updated with a new sketch. That poses chances of module being violently hacked and loaded with some other code. To reduce likelihood of being hacked consider protecting your uploads with a password, selecting certain OTA port, etc. While the above password-based security will dissuade casual hacking attempts, it is not highly secure. For applications where a higher level of security is needed, cryptographically signed OTA updates can be required. It uses SHA256 hashing in place of MD5 (which is known to be cryptographically broken) and RSA-2048 bit level encryption to guarantee only the holder of a cryptographic private key can generate code accepted by the OTA update mechanisms. These are updates whose compiled binary are signed with a private key (held by the developer) and verified with a public key (stored in the application and available for all to see). The signing process computes a hash of the binary code, encrypts the hash with the developer’s private key, and appends this encrypted hash to the binary that is uploaded (via OTA, web, or HTTP server). If the code is modified or replaced in any way by anyone by the developer with the key, the hash will not match and the ESP8266 will reject the upload and not accept it. Cryptographic signing only protects against tampering of binaries delivered OTA. 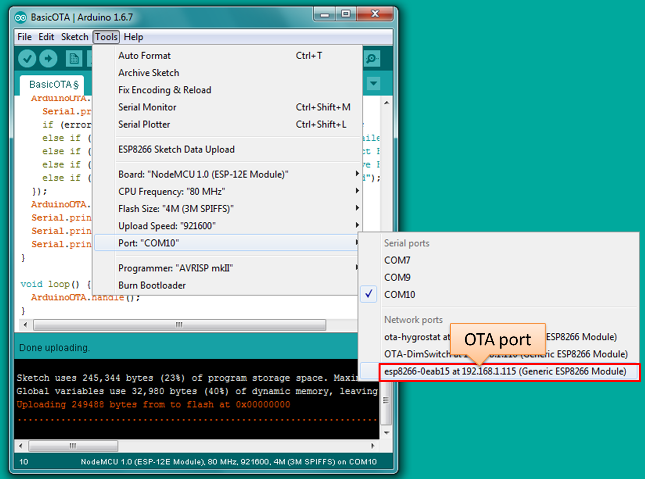 If someone has physical access they will always be able to flash the device over the serial port. Signing also does not encrypt anything but the hash (so that it can’t be modified), so this does not provide protection for code inside the device. 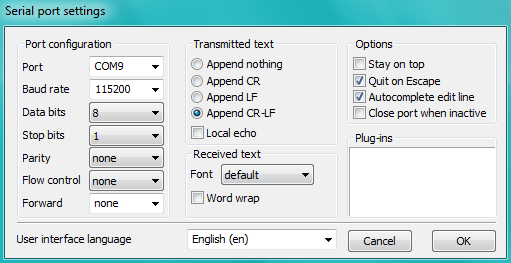 Again, if a user has physical access they can read out your program. Securing your private key is paramount. The same private/public keypair needs to be used to sign binaries as the original upload. Loss of the private key associated with a binary means that you will not be able to OTA to update any of your devices in the field. Alternatively, if the private key is copied, then the copy can be used to sign binaries which will be accepted. The format of a signed binary is compatible with the standard binary format, and can be uploaded to a non-signed ESP8266 via serial or OTA without any conditions. Note, however, that once an unsigned OTA app is overwritten by this signed version, further updates will require signing. As shown below, the signed hash is appended to the unsigned binary followed by the total length of the signed hash (i.e. if the signed hash was 64 bytes, then this uint32 will contain 64). This format allows for extensibility (such as adding in a CA-based validation scheme allowing multiple signing keys all based off of a trust anchor), and pull requests are always welcome. OpenSSL is required to run the standard signing steps, and should be available on any UNIX-like or Windows system. As usual, the latest stable version of OpenSSL is recommended. The simplest way of implementing signing is to use the automatic mode, which is only possible on Linux and Mac presently due to missing tools under Windows. 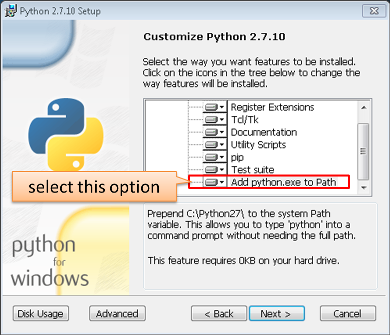 This mode uses the IDE to configure the source code to enable sigining verification with a given public key, and signs binaries as part of the standard build process using a given public key. To enable this mode, just include private.key and public.key in the sketch .ino directory. The IDE will call a helper script ( tools/signing.py ) before the build begins to create a header to enable key validation using the given public key, and after the build process to actually do the signing, generating a sketch.bin.signed file. 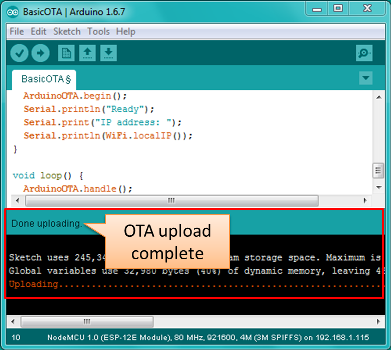 When OTA is enabled (ArduinoOTA, Web, or HTTP) the binary will only accept signed updates automatically. The above snipped creates a BearSSL public key, a SHA256 hash verifier, and tells the Update object to use them to validate any updates it receives from any method. not enough physical memory on the chip (e.g. 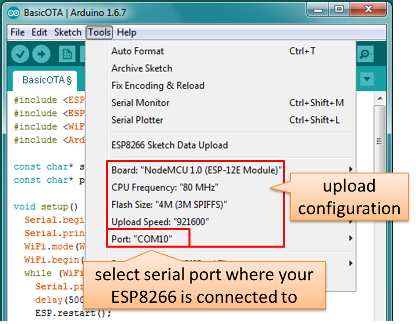 ESP01 with 512K flash memory is not enough for OTA). too much memory declared for SPIFFS so new sketch will not fit between existing sketch and SPIFFS – see Update process - memory view. 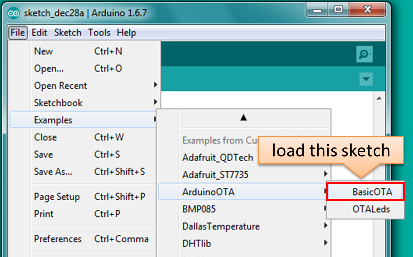 too little memory declared in Arduino IDE for your selected board (i.e. less than physical size). 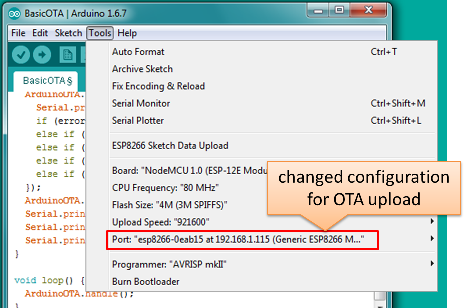 not resetting the ESP module after initial upload using serial port. 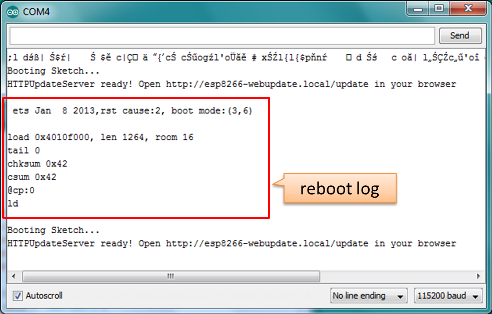 Updater is in the Core and deals with writing the firmware to the flash, checking its integrity and telling the bootloader (eboot) to load the new firmware on the next boot. 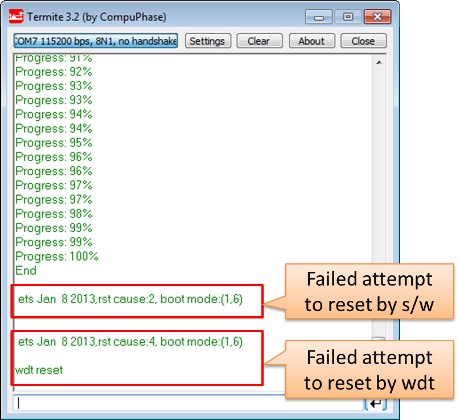 Note: The bootloader command will be stored into the first 128 bytes of user RTC memory, then it will be retrieved by eboot on boot. That means that user data present there will be lost (per discussion in #5330).